What are the benefits of Anso Nylon? Below are listed several reasons that this carpet fiber is tough, yet soft and has been proven in testing against other carpet fibers to perform in your home. Nylon is the world's leading carpet fiber because it delivers better overall performance than all other fibers, including polyester and polypropylene. When you compare the stress-strain of Anso® nylon and other nylon carpet fibers, Anso® nylon is approximately 20% tougher – a significant difference. And, the tougher the fiber, the more abrasion resistant it is. The real significance of fiber toughness comes into play in carpet appearance retention. The effects of abrasion on the fibers' surface can mean a permanent change in appearance, no matter how much the carpet is cleaned. It's another important reason to choose the toughest, most abrasion resistant nylon carpet fiber you can. Anso® nylon is more resilient. 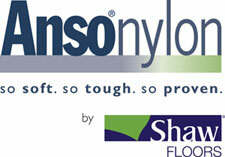 Anso® nylon is recognized as having the highest resilience of synthetic or natural carpet fibers. Ultimately, it's the twist-lock and twist-setting factors that have the greatest influence on a carpet's resilience. Anso® nylon's proprietary CrossBond™ technology enhances twist-lock, providing more resistance to crushing from foot traffic and more resistance to tip bloom and de-twisting. When it comes to the differences between nylon fibers, CrossBond™ technology gives Anso® nylon an indisputable advantage in performance. Anso® nylon is unsurpassed as a soil resistant fiber. It's a fact that when it comes to soil resistance, the most significant factor is proven to be anti-soil treatments. In test after test, carpets resisted soil and cleaned up better when the fibers were treated with an anti-soil treatment. All carpets made with any of the Anso® family of nylon carpet fibers are required to be soil-resist treated. Anso® nylon is stain resistant. Stain-resist treatment is what makes the difference in preventing and minimizing common household stains. All residential carpets made with any of the Anso® family of nylon carpet fibers are required to be stain-resist treated. We certify the stain-resist performance of every Anso® brand style before we allow the carpet mill to put our label on the carpet. The Anso® name is your assurance that your new carpet will provide many years of beauty and stain resistance in your home.